One of the biggest challenges in shear wall construction is due to limited length of wall that is available to build shear wall. 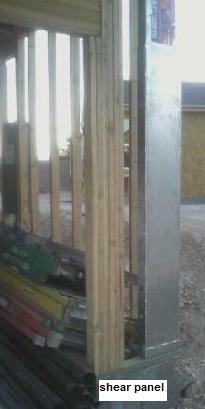 This situation commonly occurs when framing a house that has lots of door and window openings. 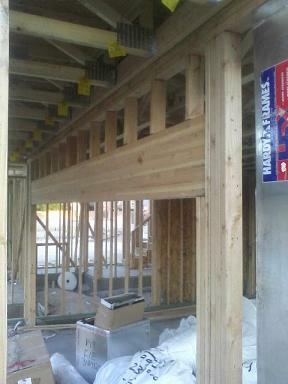 Wall framing of such opening as the garage door shown below is one of those examples that require different approach of how to framing a house. 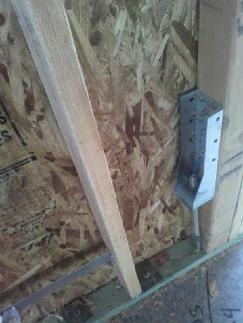 In the situation in the photo, the garage door only left 2 feet on either side of the opening for wall. This pushes the wood studs to the limit not only to support the vertical load but provide lateral resistant to wind and seismic loads. To address both of these issues, other methods had to be investigated and tested to see if they can be used at this particular situation. Since steel is far more superior than wood in terms of strength, a steel approach should be explored. One approach that will work nicely here is to use wide flange column and anchor bolts as jamb columns. By installing steel column with anchor bolts, not only the vertical ability to support load great increased, the uplift resistant as well as shear capacities due to anchor bolts are greatly enhanced. The good thing about this approach structural engineers and steel fabricators can be found locally and can be done fairly quickly. The second approach is use predesigned shear panels. There are several companies that specialize in special design of shear panels such as the one shown in the photos. This special design uses light gage steel to achieve the required shear and uplift resistant necessary for the design to work. The draw back with this approach is time. Most of these companies may require few weeks of lead time to do their own calculations, design, and ship the product on site. Over all both approaches will work but cost and timing is always a factor in deciding which method to use.